Printing standard-size digital photos (like 4" x 6" and 5" x 7") to fit into frames or photo albums requires some photo resizing. That's because most photo frames are sized for traditional 35mm images, which are rectangular, whereas the size of a digital photo is squarer. We'll show you several simple methods for cropping and printing your digital images. Supports loading of BMP, JPG, GIF, PNG, and TIF files. ...... the height). Most point-and-shoot digital cameras have a 4:3 aspect ratioa? ?they are more square-shaped than rectangular. But a 4" x 6" photo, in comparison, has a 3:2 aspect ratio. This aspect ratio, based on traditional 35mm photo film, has been the standard for decades. If you printed a true digital image without changing its size, the closest measurement to 4" x 6" would be 4" x 5.3"a? ?not good if you have a frame or album page with space for a 4" x 6" picture. This same dilemma applies to all the standard photo frame sizes: 5" x 7" (7:5 aspect ratio), 8" x 10" (5:4), etc. A digital image will not fit into a standard 4" x 6" or other standard-size photo frame without some image resizing. And most photo printers and photo labs print in these traditional sizes. The solution? Before you print your image you'll have to crop it slightly. 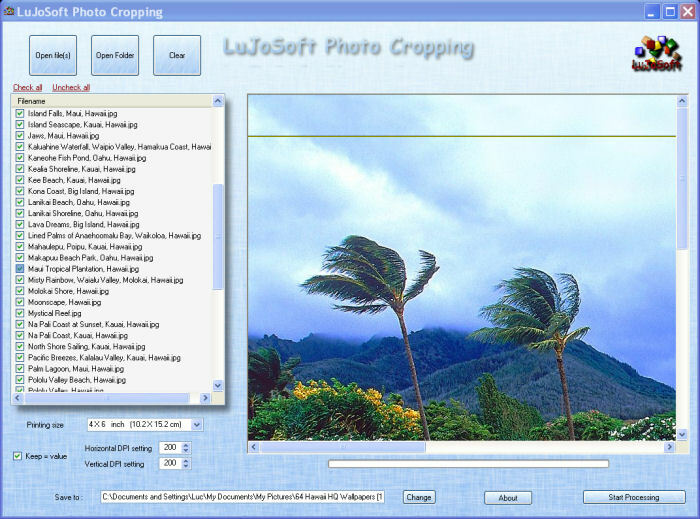 Qweas is providing links to LuJoSoft PhotoCropping 2010 as a courtesy, and makes no representations regarding LuJoSoft PhotoCropping or any other applications or any information related thereto. Any questions, complaints or claims regarding this application LuJoSoft PhotoCropping 2010 must be directed to the appropriate software vendor. You may click the publisher link of LuJoSoft PhotoCropping on the top of this page to get more details about the vendor.